It occurred to me just now that this is the first Jasper Fforde book I’ve read since we started the blog. Which means this is the first time I’ve had to write about a Jasper Fforde book. Which makes me a bit nervous because his fictional world is vast and complicated and more than a little confusing, even after years of reading his books. Here is the gist: Thursday Next is our protagonist. She lives in a parallel universe to ours where literature plays a much more important role in society than it does here. Thursday is even a member of the branch of the police force (Special Operations, or SpecOps) that is in charge of investigating crimes against literature. In the course of the first novel, The Eyre Affair, Thursday learns how to actually read herself into the Book World, where she meets and interacts with many, many, many fictional characters, and changes the ending of Jane Eyre from one in which Jane goes to India with her cousin St. John Rivers to one where Thornfield burns down, Mr. Rochester goes blind, and they live happily ever after (it’s sort of Thursday’s fault that Thornfield burns down, but that’s a matter for a different post). She joins Jurisfiction, which is basically the police force for the Book World. Her direct supervisor is Miss Havisham from Great Expectations. Obviously just from this information, this series is awesome, and everyone must read all of the books right away. Feel free to pause in the reading of this post to order all of them on Amazon. Okay, there. Thursday has many adventures, she gets married to her long time love, Landen Parke-Laine, and has a few kids, two real and one a mindworm named Jenny. I told you it’s confusing. In The Woman Who Died A Lot she has just been appointed Chief Librarian of Swindon. In a universe with such value placed on books and reading, being Chief Librarian is a much higher honor, and much more dangerous, than it would be here. In this book, as in all the others, there are people out to get Thursday and her family, and the evil Goliath Corporation is up to its usual tricks, and there is a smiting scheduled for the end of the week. Oh yes, in Thursday’s world God exists, and people have met him, and even better, the Lord, or as he is known here, the Global Standard Deity, plans smitings on a semi-regular basis. In the end, the smiting of Swindon, the town where Thursday and her family live, is averted; Jenny the mindworm/daughter is removed, sort of; the Goliath Corporation’s latest plot to kill Thursday is defeated, though if the past is any indication of the future, they’ll be trying something else again soon. I never want Fforde to stop writing these books. I’ve read all of his books with the exception of his young adult fiction, but Thursday’s series is my favorite. I can’t say enough about these books. 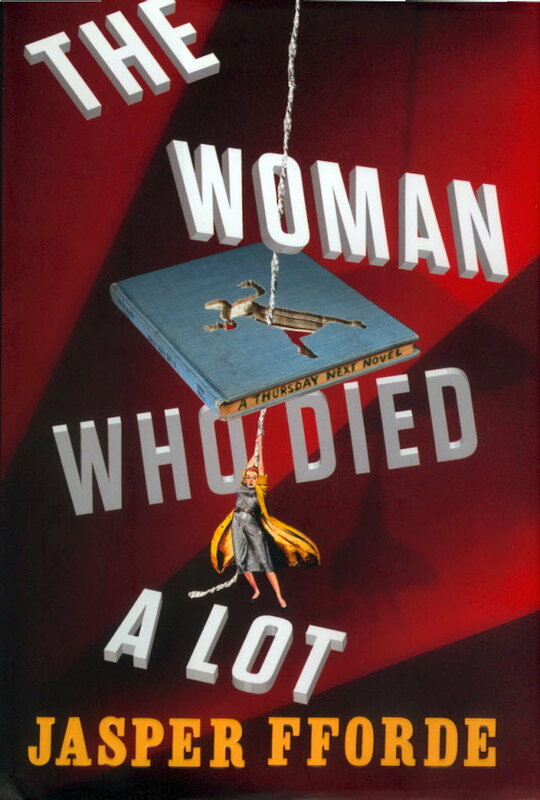 Maybe The Woman Who Died A Lot isn’t my all-time favorite, but it’s one of the top ones. There have been a couple of Fforde’s books that are so dense and obscure that I felt like an uncultured, uneducated, illiterate swine while I was reading them. This one was definitely one of the more approachable entries in the series. I was somewhat disappointed that Thursday didn’t ever go into the Book World in this one, though based on the setup in the epilogue it sounds like the next book is going to focus more on the Book World and less on Swindon, so I suppose I will survive. I don’t know many other people who read Jasper Fforde’s books. And by “many,” really I mean “any.” My dear friend Martha used to read them, but she stopped a few years ago, and now I have no one to rehash these crazy stories with, which is a tragedy to me because they are funny and weird and smart. This entry was posted in Authors, Fiction - Funny, Fiction - general, Jasper Fforde, Reviews by Jill. Bookmark the permalink. I have seem this guy’s name, but now I definitely want to read his books!